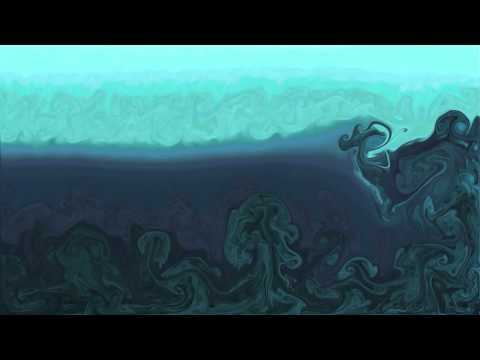 Gyre 27-29 are three related animations of two-dimensional fluid flow. Each segment begins with a regular collection of stripes, colored natural shades of blue and green. Under the influence of primitive forces, this strict organization rapidly gives way to an active, dynamic set of nested swirling motions. The three chapters differ only in one aspect -- the orientation of the stripes -- but that is enough to completely change the evolution of the system. The stretching and contorting of the flow strongly affects the colors, blending them at their boundaries, and at its most energetic leaves only large, subdued, chaotic vortices.